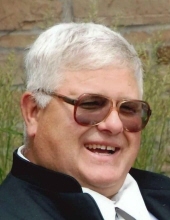 Mike “Big Mike” Wuyts, 63, Town of Lawrence, passed away peacefully on Tuesday morning, January 29, 2019. He was born January 3, 1956 to the late Harold and Virginia Wuyts. He married the love of his life, Cheryl Stibbs on February 3, 1976. Mike owned his own welding business for many years, and always had time to visit. He is survived by his wife; Cheryl, children; Matt Wuyts, Carrie (Jeremy) Braun, and his grandson James Michael Wuyts. Mike’s siblings further survive; Barbara (Doug) Williams, and Marge (Rich) Switzer, as well as Cheryl’s family; Ron (Andrea) Stibbs, Diane Stibbs, Cindy (Scott) Theunis, as well as nieces, nephews, and friends. He was preceded in death by his parents, and in laws; Sylvia (Bud) Gonnering. Friends may call after 2:00PM Saturday February 2, 2019 at Ryan Funeral Home 305 N. Tenth Street, De Pere until time of service at 6:00PM. In lieu of flowers a memorial fund will be established. To send flowers or a remembrance gift to the family of Mike "Big Mike" Wuyts, please visit our Tribute Store. "Email Address" would like to share the life celebration of Mike "Big Mike" Wuyts. Click on the "link" to go to share a favorite memory or leave a condolence message for the family.